OXFORD, England (CNS) — The election of Bishop Heiner Koch of Dresden-Meissen, Germany, as archbishop of Berlin follows tradition and stems from good church-state relations, said a church official. “One can never tell how well this system works, since the voting is secret and there’s no public consultation like in Germany’s Protestant churches,” said Stefan Forner, spokesman for the Berlin Archdiocese. “However, elements of democracy are clearly at work here, since this is a real election. Although the process generally lasts too long, the same problem can occur in dioceses which don’t elect their bishops,” Forner said. Pope Francis confirmed the election of Archbishop Koch June 8. The election occurred under the Vatican’s 1929 concordat with Prussia and revived after Germany’s reunification in 1989. A concordat is an agreement between a pope and a government concerning the regulation of church affairs. 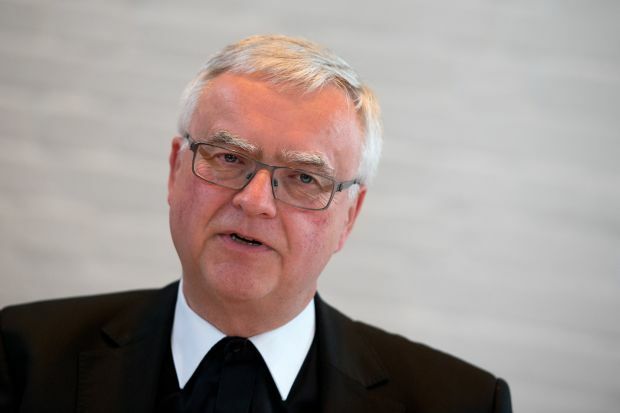 Archbishop Koch, 61, was elected June 2 to succeed Cardinal Rainer Woelki, who was transferred to Cologne Archdiocese in July 2014 after three years as archbishop of Berlin. Forner said many local Catholics, including the archdiocese’s administrator, Msgr. Tobias Przytarski, had criticized the pope’s decision to move Cardinal Woelki to Cologne. They also had said Archbishop Koch’s departure from Dresden-Meissen would also leave projects unfinished, including preparations for the German church’s Day for Catholics festival in Leipzig in May. “However, although it’s sometimes questioned whether this system allows for genuine choice, we’re pleased with this appointment, and the current methods seem to suit everyone,” Forner said. Procedures for appointing bishops, disputed for centuries by ecclesiastical and secular authorities, were codified by the Catholic Church’s 1917 Code of Canon Law, which stipulated that nominations rested solely with the pope. However, the right to elect their own bishops, from a “terno,” or list of three candidates approved by Rome, is still held by 13 of Germany’s 27 dioceses and archdioceses under the concordat as well as by the Archdiocese of Salzburg, Austria, and the dioceses of Basel, Chur and Sankt Gallen in Switzerland. Besides ensuring no local government objections, elected bishops also must swear a loyalty oath to the state constitution. Forner said the church was required only to notify, rather than to consult, government officials about episcopal nominations. However, he added that the Vatican and church leaders traditionally had been glad to seek government approval, as a means of avoiding conflict. Germany’s Deutsche Welle news agency said in a commentary June 9 that Archbishop Koch would face “tough challenges” in the Berlin Archdiocese, which announced plans in 2012 to merge its parishes into 30 larger “pastoral areas” and pool its resources in the face of falling church membership. In 2009, the archdiocese closed unused churches and laid off 40 percent of its staff. The former East Germany is widely considered Europe’s least religious territory, and ordained just six priests for its five dioceses in 2014 and three in 2013.